SpaceX's Falcon 9 rocket and Dragon capsule launched on SpaceX's fifth official mission to resupply the International Space Station, Jan. 10, 2015. Engineers with the private spaceflight company SpaceX are still trying to piece together what went wrong with a reusable rocket test Saturday, but the company's founder Elon Musk said Sunday (Jan. 11) that the rocket's steering fins ran out of hydraulic fluid during the attempt. Knowing that, Musk said that there's a better chance of a successful landing during a future test. 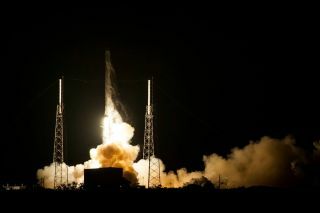 After successfully launching an uncrewed Dragon spacecraft loaded down with supplies on a trip to the International Space Station for NASA, SpaceX attempted to land a stage of its Falcon 9 rocket on a drone ship in the Atlantic Ocean for the first time. The rocket ended up impacting the platform during the test. The drone ship is in good shape, but some hardware on the deck needs to be replaced, Musk said. The "hypersonic grid fins" attached to the rocket stage for stability during landing worked well, Musk added, but they ran out of hydraulic fluid just before touchdown. "Upcoming flight already has 50% more hydraulic fluid, so should have plenty of margin for landing attempt next month," Musk wrote in another post on Twitter. It is not yet clear when exactly SpaceX will attempt another reusability test. The Dragon craft — carrying about 5,000 pounds (2,270 kilograms) of food and other supplies — is now attached to the space station, where it will stay until about Feb. 10.